Thomas and George Martin, in partnership with their friend and colleague Martin Lawrence, are producing a series of reference works about double basses and those who made them. There are many wonderful books about the violin. Many of these feature viola, cello and occasionally the double bass. Until now, the double bass has been overlooked and its rich history rarely documented in a reference work. The English Double Bass is the first in a series of books that the authors are producing. 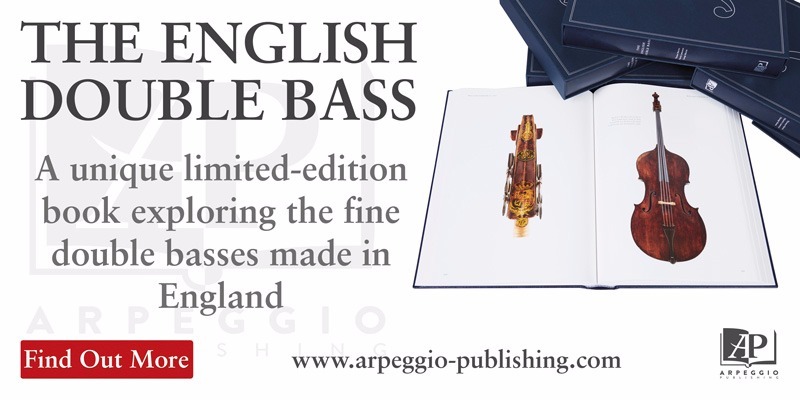 A must-have for anyone with an interest in fine double basses, The English Double Bass is the authoritative work on double basses made in England. Featuring 766 stunning colour photographs of 100 double basses by 40 of England’s great double bass makers, this 524-page book is a collector’s item. The authors have gathered a collection of double basses never seen before and presented them in a beautiful leather-bound case. Copies of this limited edition book are available from the publishers Arpeggio Publishing. Following on from the success of The English Double Bass the next publication is The Italian Double Bass. You can pre-order your patron copy now to secure this limited-edition tome.